Mangaluru, Feb 25, 2017 : Even as the bundh call given by the Parivar organisations against the visit of Kerala CM Pinarayi Vijayan to the city evoked mixed response in Ullal area, at least two government buses have been stoned on Saturday morning. Meanwhile, a NURM bus operating on the Mangaluru-Mudipu route was also stoned. Miscreants had also tried to obstruct traffic by setting tyres on fire. 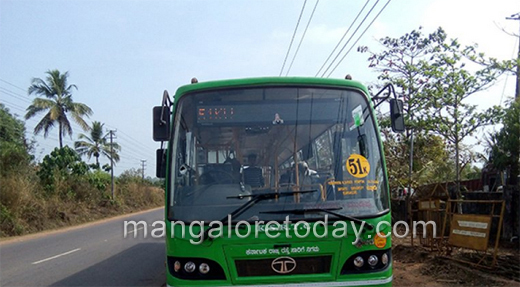 Though private buses were completely off roads in Ullal, Derlakatte Talapady, Konaje and Mudipu areas, except for Kasargod state transport buses, other government buses plied with police protection. Driver of a private bus seriously injured when a group of people smashed the windshield of a private bus that had started from Talapady to Mangaluru at Talapady. 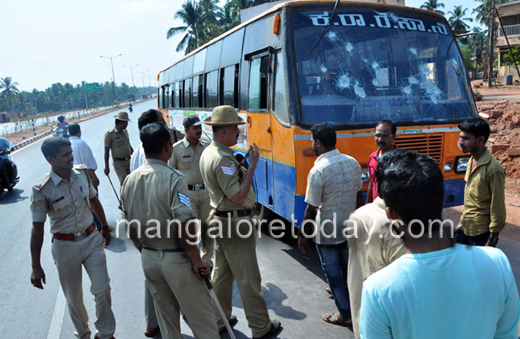 Miscreants also hurled stones on a KSRTC bus that was going to Mangaluru from Kasargod and assaulted the driver. If most shops and business establishments in Thokkottu remained open, in Kuttar and Derlakatte some shops were found closed, while most shops had downed shutters in Asaigoli and Mudipu.